I feared this would happen. That National would use the recession to do nothing about reforming welfare, the DPB in particular. Social Development Minister Paula Bennett said the rise in numbers on the DPB was a reflection of the job market. Correct in part but not to the exclusion of anything else. Bennett implies that the 8,000 increase from June 08 to June 09 is primarily about women losing their jobs. Some, yes. But it is more complex than that. Or is she actually admitting that when jobs are harder to come by women get pregnant to get on welfare? Or that people break up relationships so they can claim both dole and DPB? I don't think she is. In 2008 over 6,200 first-time mothers with babies under 12 months old were granted the DPB. 55 percent were Maori and Pacific. A third were NZ European. An important reason why the DPB is growing again is increased fertility rates, especially among the young. Throw in, as well, increasing ex-nuptial births, now approaching half of all births. If the job market is the most important influence on DPB numbers why, during a period of very low unemployment, did DPB numbers shown relatively little change? The total caseload has averaged around 105,000 for the past decade, with a low of 96,000 and a high of 109,000. It is currently at 104,400. If the job market is the most important influence on DPB numbers then this is as good as it gets. But she was confident that once the job market had improved, numbers on the DPB would drop again. Not necessarily. Young mothers entering the system stay the longest. Until National gets a grip on that fact and decides to do something about it, a high DPB toll is here to stay. I have said it before - the DPB is institutionalised. Numbers on it are affected by more factors than the job market. But if those other factors are not acknowledged, what chance they will ever be addressed? Finally ask yourself this. If a single mother has been in work and loses her job, why doesn't she receive the unemployment benefit? Why isn't she subject to the same conditions as other unemployed people? There is less pressure to work when on the DPB. That's why. And that is another reason why the Minister's optimism that the numbers will soon drop again is misplaced. How many genuinely abused children will fall by the wayside? The following figures just received from MSD show that care and protection notifications to CYF are rising significantly. 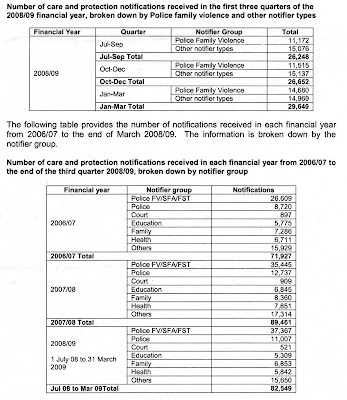 For the financial year 06/07 there were 71,927 notifications; in 07/08 there were 89,451; and for the first three quarters of 08/09 there have been 82,459. Notifications are therefore on target to rise around 23 percent on the 2007/08 financial year. This is a result of the social climate produced under the section 59 hysteria. Some will perceive it as welcome. However, CYF are cutting staff numbers and closing community offices while the workload is rising. Social workers are under increasing pressure trying to manage growing caseloads. What chance the real problems will, to use a hackneyed but useful phrase, 'slip through the cracks'? Latest benefit statistics just released by the Ministry of Social Development reveal the second largest rise in unemployment benefit receipt since records have been kept. "Not since the financial year 1988/89 has New Zealand seen such a large rise in numbers on the unemployment benefit, " welfare commentator Lindsay Mitchell said. Over the year to June 2009 the numbers rose from 18,000 to 51,000 - a rise of 33,000 or 187 percent. "The only other time such a large rise was recorded was over the period between June 1988 and June 1989 when unemployment numbers jumped by 37,000. " As well, numbers on the sickness benefit have surpassed 50,000 for the first time ever. "There was a 17 percent jump in sickness benefits from 46,000 to 54,000. Receipt of invalid's benefit grew by another 2 percent to reach 85,000 and the numbers drawing the DPB grew by 8 percent climbing to 104,000." Overall the total number of people receiving a main benefit increased by 20 percent from 258,000 to 310,000. "While some of the growth is outside of the government's control there are certainly areas in which some reform or rules tightening could make a difference. The OECD has repeatedly warned New Zealand that benefits are too open-ended in comparison with other member countries. There are no treatment requirements on people receiving invalid or sickness benefits for drug or substance abuse problems; no work-testing on the DPB; no benefit time-limits or reducing payments over time. Yet there are still areas of employment that are experiencing shortages. Childcare and care of the aged are two." "In the past New Zealand maintained almost full employment with government sponsored work schemes whereby local infrastructure projects were subsidised through payments to local government. While it is infinitely preferable for jobs to be created by the private sector, if National is not going to provide the tax relief and incentives to create these jobs, maybe it is time they started looking at options other than simply handing out money for no productive return." An elderly high profile English couple, one terminally ill and the other struggling with eyesight and hearing problems, travelled to Switzerland where they ended their lives at an assisted suicide clinic. It is news to me that Switzerland has such an enlightened approach to death. It is interesting to read the comments that follow. It is not enough that some people want to tell others how to live their lives but also how to end them. Naturally. In severe pain or drugged up to your eyeballs with morphine; in and out of consciousness but sometimes aware of the grief of those watching; slowly, with no control over your bodily functions; powerless . Your life did not belong to you so why should your death? Welcome to New Zealand. Welcome to most supposedly civilised western nations. New information released by the Ministry of Social Development shows that more than half of first-time teenage mothers giving birth in 2007 and 2008 went on welfare. "Around 2,800 mothers - or 56 percent - went on the domestic purposes benefit*. 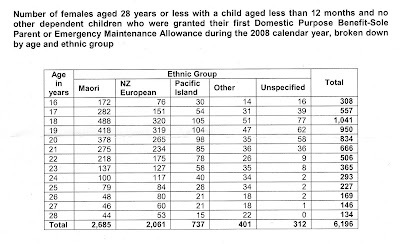 Of these mothers 48 percent were Maori, 30 percent were NZ European and 10 percent were Pacific. The most common age was eighteen. " "What's more, an unknown number of babies will have been taken into the care of family or whanau and are being raised with the assistance of an Unsupported Child's benefit. A further unknown number will be second and even third births added to an existing benefit." "Clearly teenage parenthood is a significant and ongoing cost to the taxpayer. But far worse than the financial implications are the social. Many of these children will be severely disadvantaged by impoverished environments, transience, exposure to the drug and alcohol abuse associated with 'partying' before and after birth, and subsequent poor health and educational outcomes ." "This state of affairs has been let go for decades now. Although successive governments have played the intervention card via CYF and a host of other non-government organisations, the number of materially and emotionally ill-equipped young girls becoming teenage mothers continues unabated. It is a matter of urgency that the government takes a dispassionate and evidence-based look at why this is happening and what role the DPB plays in perpetuating the problem."